A stunning beachfront adults-only haven in close proximity to Tres Rios Ecopark, and El Camaleon Golf Club. Escape the hustle and bustle of your everyday life and retreat to the 5* all-inclusive adults-only haven that is the Ocean Maya Royale. Recently refurbished you can enjoy the comfort of a renovated room, tantalize your taste buds at the new Italian restaurant called La Dolche Vita, and rejuvenate your mind and body at the hotel's exquisite spa. This resort also offers 'Privilege, Exclusive Rooms and Services' for those guests seeking a more exclusive stay. 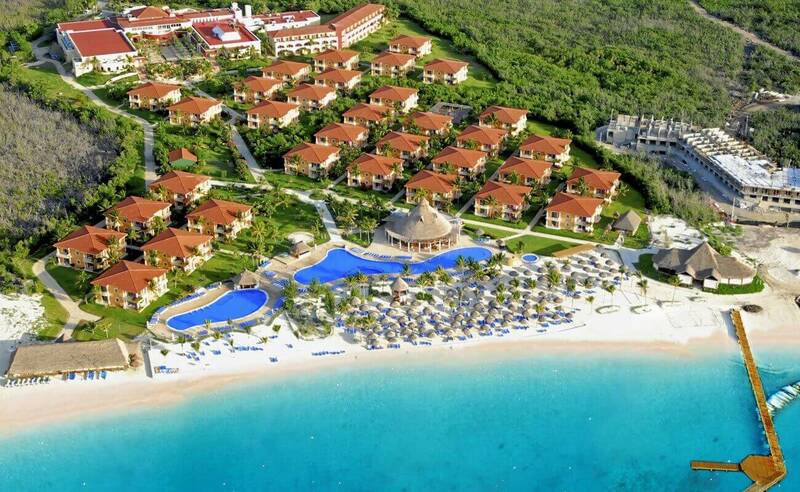 At the Ocean Maya Royale, all rooms come with air-conditioning, balcony or terrace, minibar and room service. The deluxe double rooms are great if you want to guarantee a sea view. If you wish to upgrade you can opt for a club junior suite or suite with a Jacuzzi. The junior suites also come with Privilege Club benefits including preferential booking in the a la carte restaurants and personalized check-in and out. At Ocean Maya Royal resort you will find 6 restauraunts and 4 bars. Their are an array of different flavors and cuisines on offer to satisfy the cravings of every traveler. BLUE MOON RESTAURANT - Romantic evening meals with a wide range of international cuisine (NEW). OPENING HOURS: 6 pm - 10 pm. LA HACIENDA RESTAURANT - A buffet restaurant which offers a variety of international cuisines freshly made by the chef, from breakfasts through to themed dinners alike. OPENING HOURS: Breakfast: 7 am - 11 am, Lunch: 12.30 pm - 3 pm, Evening meal: 6.30 pm - 10 pm. EL CHARRO - The restaurant is situated in front of the pool. During the day, it serves a wide selection of international dishes freshly made by the hotel's chef and during the evening it is transformed into a Mexican restaurant. OPENING HOURS: Snacks: 11 am - 5.30 pm, À la carte Mexican dinner: 6.30 pm - 10 pm. YOOKOSO - À la carte Asian restaurant with teppanyaki grills (REFURBISHED)! OPENING HOURS: 6 pm - 10 pm. MIKE'S COFFEE - Speciality teas, coffees and home-made cakes. OPENING HOURS: 4.00 pm - 11 pm. LOBBY BAR - Located in the hotel's central hub, offering a wide variety of national and international drinks. OPENING HOURS: 24-h.
AQUA LOUNGE - OPENING HOURS: 24-h.
RESCO JUICE BAR - Specialising in tropical fruits and juices (NEW)! OPENING HOURS: 11 am - 5.30 pm. At Despacio Spa Centre you will be able to enjoy a wide range of beauty treatments and massages by the team of professionals at Ocean Maya Royale so that you can relax and fully rejuvenate. Treatments include personalized health and beauty services, hairdressing, and massages. It is the epitome of Caribbean bliss! Encapsulated by jungle and the twinkling turquoise colors of the Caribbean sea, the Ocean Maya Royale Resort offers 4 different meeting rooms suitable to accommodate all of your needs. Whether planning cocktail receptions, banquets, corporate functions, team training sessions, or special occasions, we can help you get organized. Our dedicated weddings teams can help you plan every last detail from tours to eating, to room layouts, and decorations. We do everything in our power to ensure your big day runs as smoothly as possible. The Ocean Maya Royale boasts several areas indoors and outdoors for your ceremony and reception. Learn more about having your destination wedding at The Ocean Maya Royale, contact us for weddings. At Ocean Maya Royale you will find a complete program including sports and other activities organized by their entertainment Blue Team. SCUBA and diving opportunities are also available for an extra charge.